COPENHAGEN, Denmark, December 19, 2009 (ENS) – Just before 01.00 on Saturday morning, a number of heads of state and government agreed on a draft climate agreement at the UN conference in Copenhagen. The draft includes agreement on the target of limiting global warming to two degrees Celsius and on money for climate financing. The draft agreement came after high-level negotiations in a smaller circle of around 30 countries – including China, India and the United States, as well as European Union member states. Now other countries will decide their positions on the proposal. “Let us speak plainly, I would have liked more. This will not solve the threat of climate change. But it is a first step, an important step,” said Swedish Prime Minister Fredrik Reinfeldt at a press conference after the end of the meeting early this morning. The Danish Presidency will now present the draft to all countries in the plenary meeting at the climate change conference. After this, the meeting will be adjourned, to then be resumed for a general debate. All countries must be in agreement for the proposal to be adopted. In the agreement, a commitment of US$30 billion from industrialized countries over the period 2010 to 2012 was decided, as fast start funding for adaptation, emissions reductions, research and capacity building in developing countries, including funding to prevent deforestation. Mobilization of financing for the needs of developing countries beyond the year 2020 is also addressed in the agreement and is estimated at US$100 billion per year from 2020. “What we wanted to achieve when we came here to Copenhagen was to get us out of the deadlock. Either we do something or we land in nothing. And now we have seen countries make efforts and set goals. 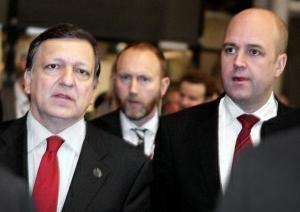 Even countries that said they wouldn’t make any commitments have presented figures,” said Prime Minister Reinfeldt. Attached to the agreement is an annex, where countries or groups of countries can fill in their commitments on emissions reductions or climate change action. But the agreement is not sufficiently ambitious for the European Union to change its emissions target to a 30 percent reduction by 2020, Reinfeldt said, and the EU’s target remains 20 percent by 2020 compared to 1990 emission levels. A fund is proposed in the agreement, called the Copenhagen Green Climate Fund. Money will be channelled through the fund to support different initiatives for adaptation, emissions reductions and technology development. A mechanism will also be established to intensify technology transfer between developed and developing countries. At the time of writing, the parties are going into the plenary meeting. What the outcome of the meeting will be is still uncertain. 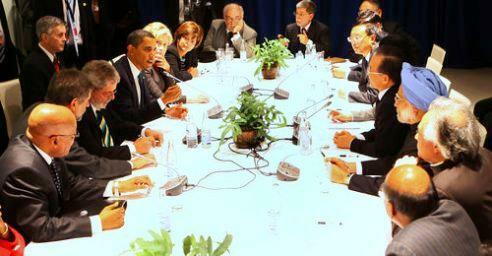 In addition, on Friday evening, President Barack Obama had a meeting with the leaders of China, India, Brazil, and South Africa. This meeting came about somewhat unexpectedly as Obama believed he was entering a meeting room for a scheduled bilateral meeting with Premier Wen Jiabao of China and found the other three leaders there as well. A senior administration official told reporters that when Obama’s officials sought meetings for the President with the Indian, Brazilian and South African leaders Friday evening, they were told that Prime Minister Manmohan Singh, President Lula da Silva and President Jacob Zuma were already at the airport. At a press conference at the Bella Centre before he took off for Washington, Obama told reporters the outcome of that impromptu meeting. “We agreed to list our national actions and commitments, to provide information on the implementation of these actions through national communications, with international consultations and analysis under clearly defined guidelines,” Obama said. “We agreed to set a mitigation target to limit warming to no more than 2 degrees Celsius, and importantly, to take action to meet this objective consistent with science,” he said. “Taken together these actions will help us begin to meet our responsibilities to leave our children and our grandchildren a cleaner and safer planet,” the President said. Yvo de Boer, Executive Secretary of the UN Climate Change Secretariat, said it remains to be seen how the text will be received by the broader group of countries. “It’s great that a small group of leaders gets together and tries to advance the process. But ultimately the way things work here it has to be acceptable to every country,” de Boer told Reuters. The 119 heads of state and government who attended the Copenhagen climate summit represent countries that account for 89 percent of the world’s GDP, 82 percent of the world’s population and 86 percent of global greenhouse gas emissions. Included in the 119 countries are the 20 largest economies and the top 15 greenhouse gas emitters in the world. Many world leaders are still in Copenhagen where another session will be convened in the morning.